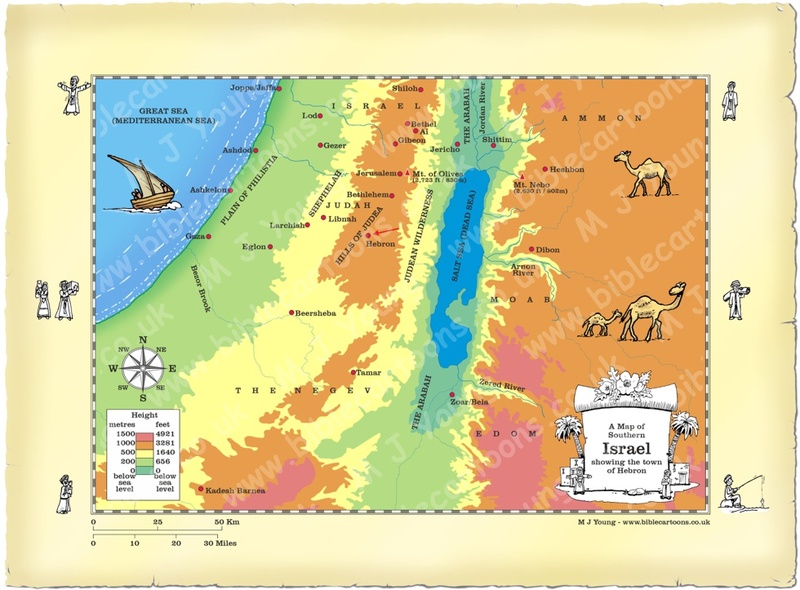 This is my map of Southern Israel showing Hebron, a town in the mountains of Judah, between Beersheba and Jerusalem. It was originally called Kiriath-Arba (Genesis 23:2; Joshua 14:15; Joshua 15:13). Genesis 13:18 makes the first Biblical mention of the town, relating Abram’s move to camp in the oak grove owned by Mamre the Amorite. (see Genesis 13:18; Genesis 35:27). It was at the oak grove of Mamre that Abraham encountered 3 men and discussed with the Lord the fate of the cities of the plain (Sodom, et al). Sarai-Sarah died at Hebron (see Genesis 23:2) and the cave of Machpelah,, near Mamre. Several important characters from the Old Testament lived or died at or near Hebron. Among those who lived there were Abraham (Genesis 13:18), Isaac and Jacob (Genesis 35:27). The Hebrew spies visited Hebron whilst scouting out the Promised Land for Moses (Numbers 13:21-22). David made Hebron his royal capital (2 Samuel 2:1-4; 2 Samuel 5:5; 1 Kings 2:11) and ruled from there for over 7 years. When David’s son Absalom wanted to ururp his father he set up his base of operations at Hebron (2 Samuel 15:10). Joshua took Hebron from the descendants of Anak who lived there (Joshua 10:36-37; Joshua 12:10), and Caleb retook it (Joshua 14:14). 18 Then Abram moved his camp to the oak grove owned by Mamre, which is at Hebron. There he built an altar to the LORD. 1 When Sarah was 127 years old, 2 she died at Kiriath-arba (now called Hebron) in the land of Canaan. There Abraham mourned and wept for her. 21 During this period, Joshua destroyed all the descendants of Anak, who lived in the hill country of Hebron, Debir, Anab, and the entire hill country of Judah and Israel. He killed them all and completely destroyed their towns. 22 Not one was left in all the land of Israel, though some still remained in Gaza, Gath, and Ashdod. 11 David made Hebron his capital, and he ruled as king of Judah for seven and a half years.